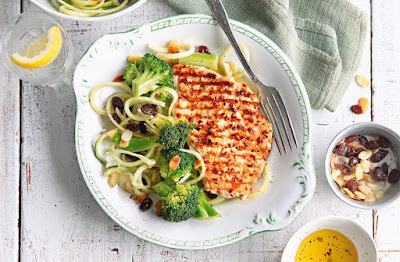 A virtuous supper of simple griddled chicken breast served alongside a broccoli, courgetti, almond and raisin salad. This fuss-free and delicious family meal is ready in just 30 minutes. To make the salad, cook the broccoli and garlic in a pan of boiling water for 2-3 minutes, until the broccoli is al dente. Drain and cool for 10 minutes. Meanwhile, sandwich each chicken breast between 2 sheets of clingfilm on a chopping board. Using a rolling pin, bash until flattened to about 1/2cm (1/4in) thick. Rub with the olive oil, sprinkle with the lemon zest and thyme or chilli. Season well. To make the dressing, whisk the lemon juice, oil and sugar in a bowl with some seasoning. Put the broccoli, garlic, almonds, raisins and courgette in a bowl. Pour over the dressing and toss to coat; set aside until needed. Heat a griddle pan on the hob. Add the chicken and griddle for 3-4 minutes on each side, until cooked through with no pink meat showing. Serve the chicken with the courgetti.